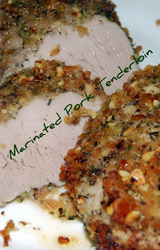 David made this quick and easy marinated pork tenderloin recipe last night for dinner..... it was absolutely delicious. breadcrumbs, that forms a gorgeous crunchy crust when it's roasted. Then it's served up sliced with its own yummy sauce that is made in a jiffy. 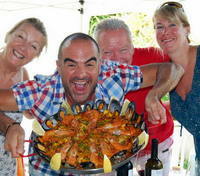 A great dish if you are entertaining....or if, like us, you just want to treat yourselves to something really tasty. Another great Mediterranean Diet recipe. First of all, using a sharp filleting knife and a chopping board, trim the pork tenderloin/fillet removing any fat or sinews. Next brush the whole of the tenderloin with olive oil and then rub in the garlic...don't be afraid to use your fingers. Mix well the other crust ingredients and roll the pork into them until well and evenly coated. Allow it to stand for at least 2 hours covered in cling film. Preheat your oven to 220ºc/425ºf and put in the pork onto the middle shelf, then immediately turn down to 200ºc/400ºf. Roast for 20 minutes turning once half way through. While the pork is roasting make the sauce. Fry the onion over a medium heat until soft and golden. Flambé in the brandy, add the sherry and the stock and simmer for 2 minutes. Thicken the sauce to taste with the cornstarch/cornflour mix and season. Add any meat juices that have come out of the resting pork. 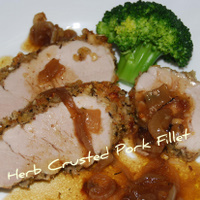 To serve: slice the pork diagonally (see picture) arrange an warm plates and pour the sauce over. Great with our scallop potatoes and a fresh green vegetable of your choice.